The Israeli army scored a significant achievement in the last two Fridays’ clashes: It stopped Palestinian protestors from breaking through the fence, it prevented the situation from deteriorating to a comprehensive conflict and it didn’t violate Israeli communities’ holiday routine with Code Red alarms. This achievement also proves that Hamas can gain full control on the ground when it wants to. The Karni Crossing, Friday. From 10 am, Gazans have been travelling down the road leading from Saja’iyya to the Karni Crossing, which used to be the main meeting point between the Israeli economy and the Gazan economy. They settle between the water tower and the large greenhouses, near the border. In front of them, there are two fences. One stretches along the borderline. It’s an improved system equipped with all the electronic accessories. To the west, within the Gaza Strip’s sovereign area, there is a looped barbed fence aimed at preventing access to the border fence. The distance between the two fences is 70 to 100 meters. This is the battlefield or, if you insist, the killing zone. On ordinary days, one can see IDF equipment and soldiers operating in this area, with the Gazan side’s forced acceptance. A Palestinian who enters this area is seen as trying to break through the border fence into Israel. The IDF order is to implement the rules of engagement: First of all, to shoot into the air, and then to shoot towards his body. The Palestinians try to roll burning tires into this area, hoping they will set the border fence on fire. Meanwhile, they conduct an experiment: Every burning tire raises a cloud of black smoke. The west wind carries the smoke over the young jojoba orchard, whose seeds are used to produce oil for cosmetic purposes. Cosmetics and tire smoke don’t go together. From there, the pillar of smoke travels to the homes of Kibbutz Nahal Oz, and moves eastward towards Kibbutz Sa’ad. The smoke produces great photos. It’s what it does best. The battle is over the narrative, the perception. “There is no other story here,” one of the IDF commanders tells me the next day. The question is how will this day be perceived by the Israelis, by the Gazans, by the Palestinians in the West Bank, by the public opinion in Arab countries, by Western governments. Five different fronts, each with its own politics. Israel can’t win such a conflict. All it can do is avoid losing. Now, I’m going to complicate this complex account even more by saying that although Hamas and Israel are archenemies, although each side seeks to eliminate the other side, both sides have a shared interest in some sense. I’ll explain. But that’s our goal too, I said. Major-General Yoav Mordechai, the coordinator of government activities in the territories, traveled last month to Cairo, to Washington (twice) and to Brussels to try to convince Arab and Western governments to do something to prevent Gaza from collapsing. If Gaza falls, it will fall on our doorstep. As far as he’s concerned, I said, it’s a good idea. 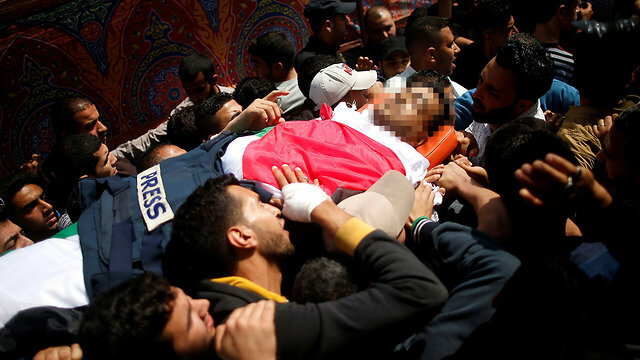 Nineteen or 20 Palestinians were killed on the first Friday, I said. The orders received from the General Staff are clear. A soldier is allowed to fire in three cases: If he is in a life-threatening situation, if he detects damage to state infrastructure and if he spots key instigators. In the last case, he must receive approval from a commander. First, he fires into the air, and only then he shoots towards the person’s body. I saw the crowds flocking to the border, I said. They included women and children too. I returned to the jojoba orchard, opposite the Karni Crossing. It was 2 pm, when the prayers at the mosques came to an end. Around the water tower, the crowds totaled several thousand people. Black smoke emanated from four other spots in the north and in the south. The ambulance screams blended with the shouts from the crowd and the warning announcements from the Israeli side. A tire was followed by a tire. Brigadier-General Dedi Simchi, the commissioner of Israel’s Fire and Rescue Services, arrived with his elite unit, 36 firefighters whose unit is known as Lehava (“flame”) —the same name chosen by one of the Kahanist gangs. The firefighters brought water cannons to use against the tires. They also brought huge ventilators, wind-pushers. Some 20,000 Gazans arrived at the fences, half the number of people who arrived the previous Friday. The death toll dropped by half too, to nine. But the numbers don’t matter: As far as Hamas is concerned, it was an achievement. “They are achieving more in these events than they achieved in Operations Cast Lead, Pillar of Defense and Protective Edge,” one of the officers told me. But this story isn’t a zero-sum game. The IDF’s achievement in the two days of conflict isn’t insignificant: It stopped the protestors from breaking through the fence, it prevented the situation from deteriorating to a comprehensive conflict and it didn’t violate the holiday routine in the Israeli communities. “There wasn’t a single Code Red alarm during the holiday,” one of the officers told me. Hamas played a considerable part in this achievement, I said. It wasn’t worthwhile for it to fire Qassam rockets, so it didn’t. 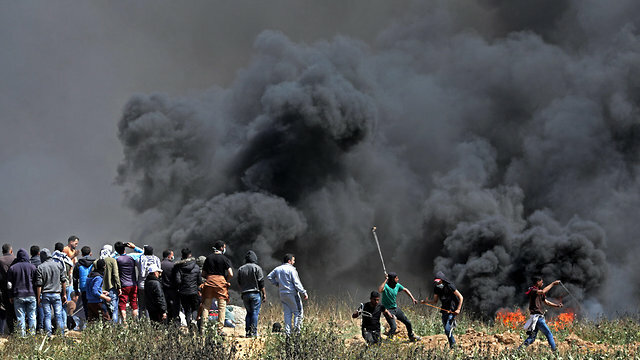 These days prove that Hamas can gain full control on the ground when it wants to. 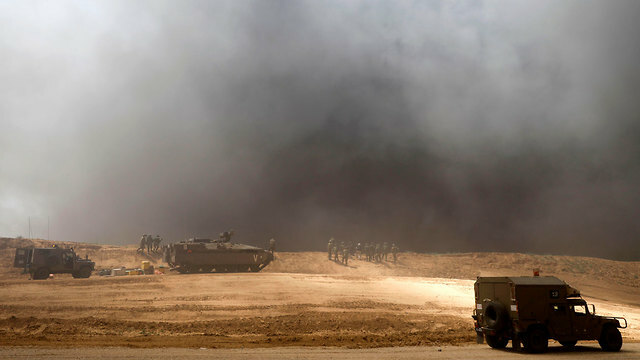 The IDF’s failure is on another front, in convincing the political echelon to do something positive to prevent Gaza from collapsing. Military documents raise different ideas, including transferring the control of Gaza from Hamas to the Palestinian Authority or to a consortium of Arab League states. The documents talk about investments in Gaza, including Israeli government investments, in rebuilding the civilian infrastructures, the water, the sewage, the electricity, etc. Gaza could threaten us in ways we have yet to experience. For example, with an epidemic that would spread into Israel. Or perhaps with a white flag that would be raised over all the homes of Gaza. And then what would we do?